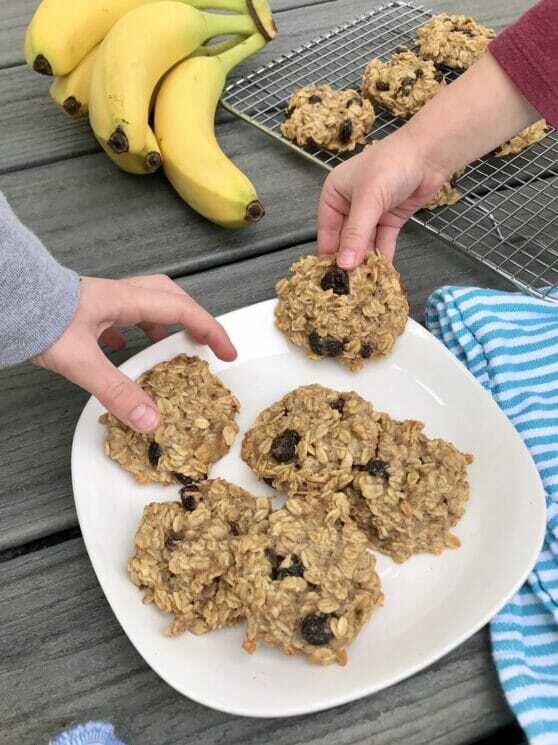 You can give your kids these soft, sweet, Sugar Free Cookies just about any time. Serve them for breakfast, tuck them in your big kids’ lunchboxes, or add one to your busy toddler’s snack plate. Sugar, and sugary treats, are all around us. It can be exhausting trying to limit the amount of sugar your kids come in contact with. But there are surprisingly delicious and creative ways to enjoy sweet treats with your kids without adding any refined sugars at all! 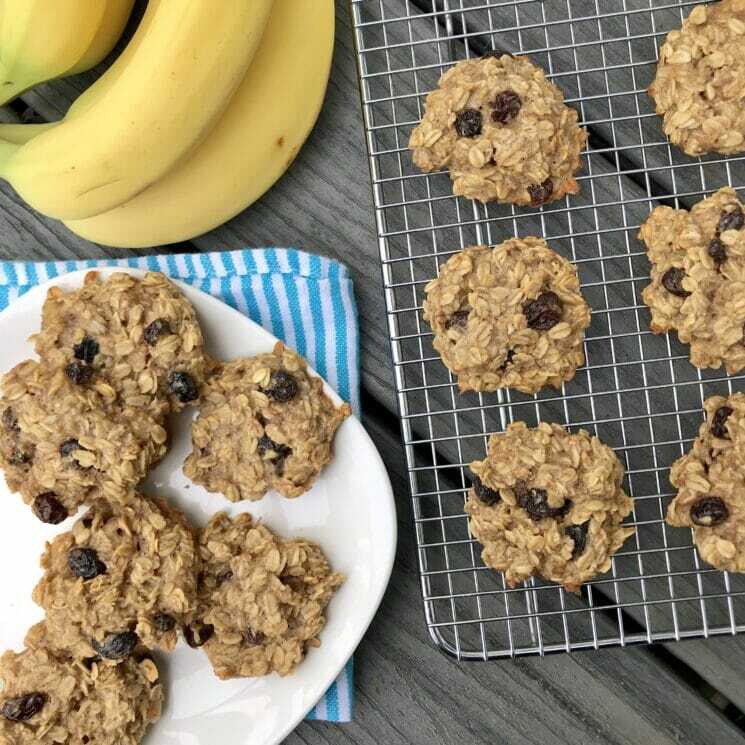 Here’s one to try today: delicious, easy, “anytime” cookies that are 100% sugar free, sweetened only with whole fruits, and studded with whole grain oats. These cookies have been a staple in our home for years. They’re a feel-good choice for snacking toddlers, and a smart addition to lunchboxes. If you’re the kind of person who likes to enjoy the best of both worlds (those worlds would be “healthy” and “indulgent” and we are all that kind of person) then it’s time to get baking! 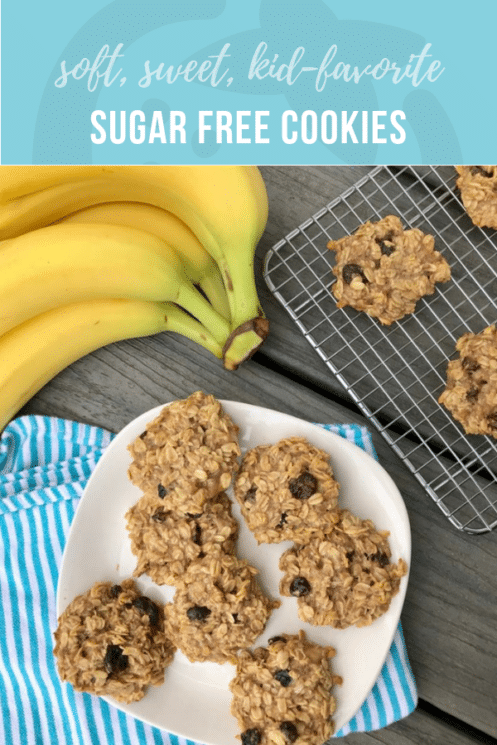 Sugar Free Cookies: How Do They Taste? 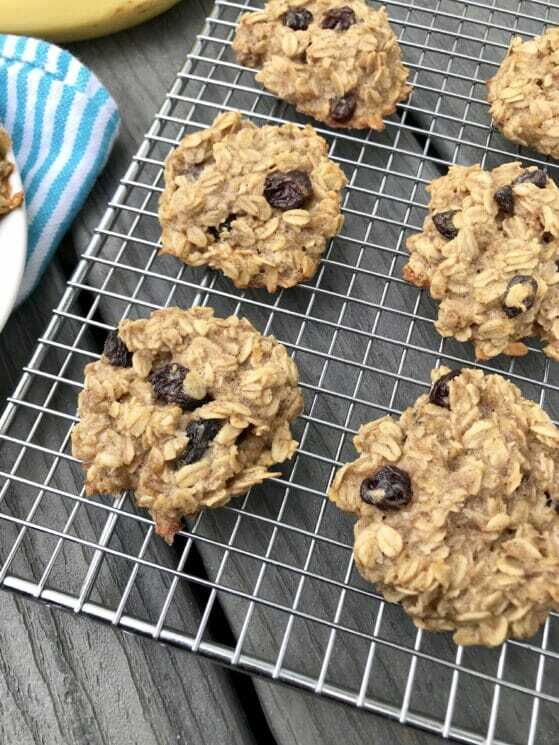 When you bite into these cookies, the first thing you notice is that they’re just plain delicious: gently sweet and flavorful, with soft chewy oats and raisins. If you’re skeptical they won’t have enough flavor without sugar, you’re in for a pleasant surprise. The cookies boast a slightly crispy, caramelized taste at the edges, and an interior that’s moist and cinnamony. You and your kids will want to have two or three at once. And you can. The secret to a delicious, nourishing sugar free cookie lies in the fruit. Some fruits can stand in for sugar in baked good recipes, like dates, mangoes, and applesauce–anything with a high sugar content. In this recipe, we use bananas. 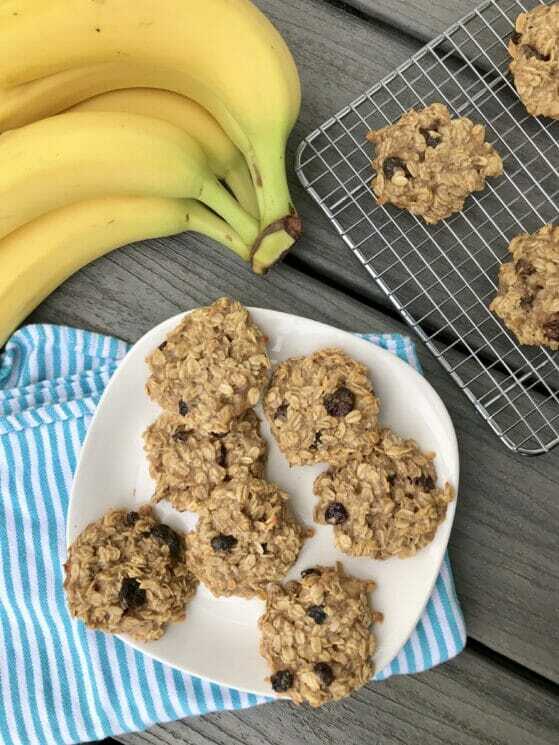 Bananas are naturally high in sugar, and they also help keep the texture of the cookies moist and fluffy. These cookies are ever-so-simple to make. The dough may look a bit more wet than your typical cookie dough, but don’t worry–it’ll turn nicely golden brown in the oven. Because the cookies don’t change shape dramatically in the oven (unlike typical cookies,) it’s wise to flatten the dough/batter into the size and shape you want your cookies to be before you bake. 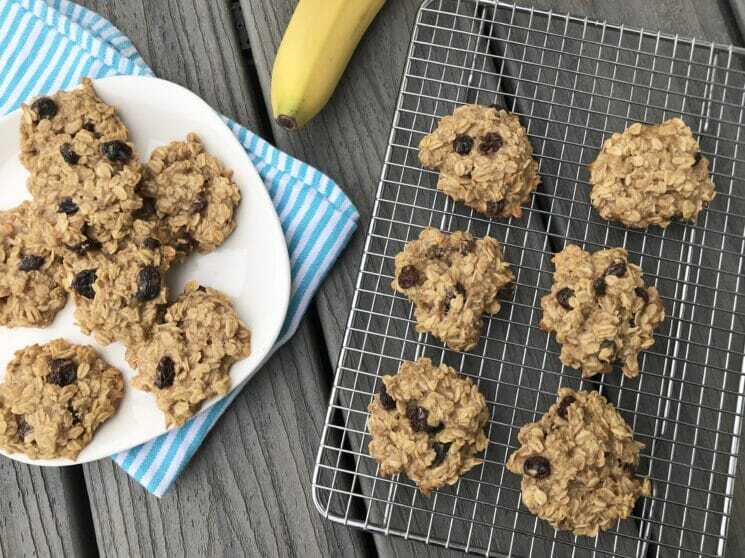 You can store them in the refrigerator to help them keep their color (banana-based baked goods can turn gray-ish left out on the countertop.) Let them come to room temperature before eating, or warm them up in the toaster oven for a few minutes. Leftovers do freeze well, if you can restrain yourself long enough to freeze them. Preheat oven to 350 degrees F. Lightly grease baking sheets and set aside. If coconut oil is in a solid state, heat gently until just melted. Mash bananas; add to coconut oil and mix well. Fork-whisk in the egg and vanilla. Stir in the oats, cinnamon, and raisins until combined. Spoon the dough onto the baking sheets (you’ll make 12-14 cookies.) Bake for 15-18 minutes or until slightly golden. Serve warm, or room temperature. Refrigerate or freeze leftovers. Have you ever tried Agave Nectar? It’s fabulous, all natural, you use less of it than sugar, and it has a sweet taste. It is a little spendy but if you’re trying to cut down on sugar it’s a really good way to go. I use it as a sugar supplement. Does honey count? I usually sweeten everything with honey and I love it. I even put it in our shakes when I try to hide all the other goodies I try to slip in like flax and spinach and tofu. Hmmmm, this is definitely something I should do. I have gotten way too hooked on the sweet stuff! I was just going to add that we also use natural honey…you can replace white sugar with honey. We put in half as much honey as sugar. No one cared! In fact we like it better =) Looking fwd to hearing what you think…Thanks! Lori; we do use Agave nectar. Many times we’ll put that on toast rather than honey and we like it just as well. Vanessa and Dramamama; To ask whether honey counts would depend on the reason for eating less sugar. Nutritionally, my opinion is honey is much superior to other sweetners and definitely has a place in a balanced diet. So if we do sweeten things up, it should come from honey. However, I am also trying to make things less sweet to the taste buds…so I am going to cut back a little on the honey as well. I agree….in time the taste buds should adjust. Salt is the other one. Hmmm. Thanks for sharing! I tried making sugar free cookies not to long ago too with bananas. And then with applesauce. And like you, I was the only one that liked them (because like you, I’m usually the only one that likes anything that even resembles healthy)and really I don’t need them either. So they’re sitting in my fridge getting freezer burnt. I look forward to seeing if you can find any better solutions! people who are on the pro-legalization side of the debate. event or case of severe side effect to FDA.